Mayo Clinic researchers are suggesting physicians evaluate patients’ gait during routine appointments, as the researchers have discovered an association between slower and unstable gait in older adults and a higher risk of cognitive decline. Though the research, which was presented last summer at the Alzheimer’s Association International Conference by neurologist Roldolfo Savica, MD, MSc, is new, physicians have been noticing the link for some time. “Anecdotally, I see this in my practice,” says Gary Small, MD, a professor of psychiatry and biobehavioral sciences and the Parlow-Solomon Professor on Aging at UCLA. He notes that CT scans of Alzheimer’s patients’ brains show a decrease in brain metabolism in areas that control reasoning, memory, and thinking. However, the area of the brain that seems to be spared during aging and cognitive decline is the sensory motor strip. “This effectively means that if you put your hand under a hot faucet, your brain will register that the hot water hurts, and you’ll move your hand out of the way,” says Small, who also is director of the UCLA Center on Aging and coauthor of The Alzheimer’s Prevention Program. Savica’s research agrees. “In order to walk correctly, you require the perfect integration of many areas between your brain and body. It becomes automatic and you don’t notice it now, but later on in life in older adults, that constant and perfect integration becomes impaired at one point,” he says. Before an older adult shows symptoms of cognitive impairment, he or she may exhibit gait problems. Consider it a presymptom, Savica says. In fact, doctors may recognize gait impairment as many as 10 years before mental symptoms appear, according to Savica, though this currently is just an estimate and more studies are needed. However, he can say with confidence that this decline may occur several years before a diagnosis of mild cognitive impairment. Before physicians can consider gait instability as a definitive early indicator of Alzheimer’s disease or other dementias, this association needs to be further tested. “Whether this would be better than conducting a brain scan or cognitive tests to determine if a patient is suffering from mild cognitive impairment, we don’t know,” Small says. However, he notes that it warrants additional exploration, as a gait test would be far less expensive than a brain scan as a potential diagnostic test. Even if gait instability were taken into consideration in diagnosing mental decline, of course, it wouldn’t be the only symptom doctors evaluate. “We can’t just tell someone that they will develop the disease because of their gait. It is more complicated than that,” Savica says. If a patient displays problems walking, it should raise a red flag for his or her physician. Healthcare practitioners should be aware that mild cognitive impairment may affect older adults’ gaits in several ways: They may walk more slowly, take smaller steps, or look insecure as they approach an obstacle such as a stairway. “Elderly patients recognize their own frailty, and that’s one reason they may appear tentative when walking. It’s harder for them to recover from injury and the distraction of multitasking or being concerned about mild memory slips can cause this instability in their walk. They have a lot on their minds,” Small says. 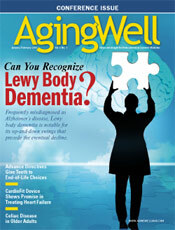 Similarly, if an older patient already has experienced cognitive decline, physicians should perform a gait assessment. If a patient’s balance or walking is unstable, a physician should work with family members to ensure that it’s safe for the patient to move around the home or determine the need for an aid such as a walker or cane. Physicians should encourage patients to exercise even if they have gait problems. Government recommendations call for 30 minutes of moderate exercise five days per week. “This will help improve mobility and physical function as well as decrease the risk of cognitive impairment,” Savica says.